An underground nuclear missile base? That is an awesome theme, too bad it never became a reality. That might have been awesome. If that suggested woodie a few years ago was called SW6, shouldn't this really be called SW7? No because they never approved the Woodie, however the Arrow Pipelines were all ready for construction and got cancelled. On this basis as the Woodie never got past the planning stage it could never be called an SW ride. I think we will be getting a vertical track drop (i.e. the entire length of the track which is horizontal drops vertically giving the feeling of the floor disappearing) If you look at the latest photos of construction there is an almighty hole appearing! ^ Any chance you could post a few photos? This photo was taken on the 21st of July, I have seen a more recent one where the hole looks slightly deeper, but cannot find it at the moment. Fantastic - didn't realise construction had started. Does this mean it has been fully approved? (Planning permission wise?). I'd assume they wouldn't start major earth-works without it anyway. That said, with a baby on the way, not sure when I'll next get to AT! ^ Correct. That was approved a while back now. Construction's looking good. I really like how much they manage to keep it very secretive. ^ Yet a layout was released about half a year ago. Even so, it should be great. I hope they go all out on the theming like they did with Nemmy. ^ Yeah, but we still don't know what type of coaster it's going to be. For definite anyway. I'm pretty excited about it. 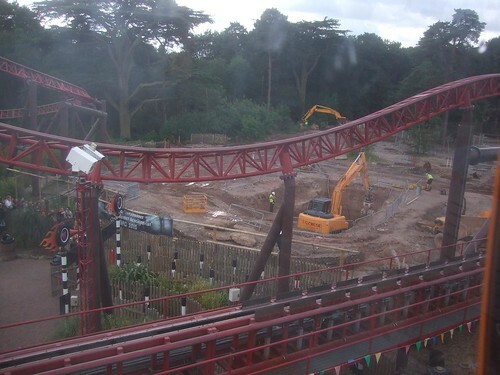 I hope they do as good a job as SAW with the theming. It really does make the ride an experience. Edit: Just realised we said pretty much the same thing. New posters for SW6. From Twitter. I would have uploaded the picture but I'm on my iPhone.